Our On-Site Engineering division has recently completed a significant leak sealing project for a client based in the African sub-continent. 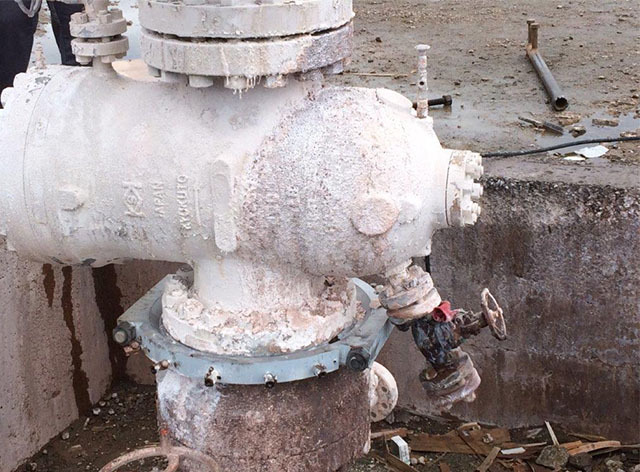 A steam leak was reported at one of the geothermal wells with a leaking Master Valve Flange. Our engineers were called to carry out a live demonstration of leak sealing solution that would benefit no stoppage in operation and avoid quenching of the valve. After conducting a thorough site survey, the team designed a Ring Clamp that would fit between two flanges of 10” 900# Master Valve, operating at 1,000 to 2,000 psi and above 200 deg. C. The design and fabrication of the clamp was in accordance with ASME Section VIII Div1, boiler and pressure vessel code and material selection as per ASME Sec II Div 1. The clamp was then successfully installed and injected with sealants in order to complete the leak sealing operation. By completing the work online, the client was able to avoid quenching of the well which would have otherwise resulted in the complete loss of well and stoppage in operation. The process of sealing leaks in pressurized components such as valves, flanges, fittings, etc., is well established. Our leak sealing engineers are capable of performing the process successfully on several mediums such as steam, water, hydrocarbons and on wide range of chemical systems at pressures up to 8,500 psi and temperatures from minus 320 deg. F to plus 1800 deg. F.